Grapes are a great food. Open up a bag of grapes, pluck them from the stems, and just pop them in your mouth one after the other. They’ve got a nice crunch, and they’re yummy. But that can get kind of boring. 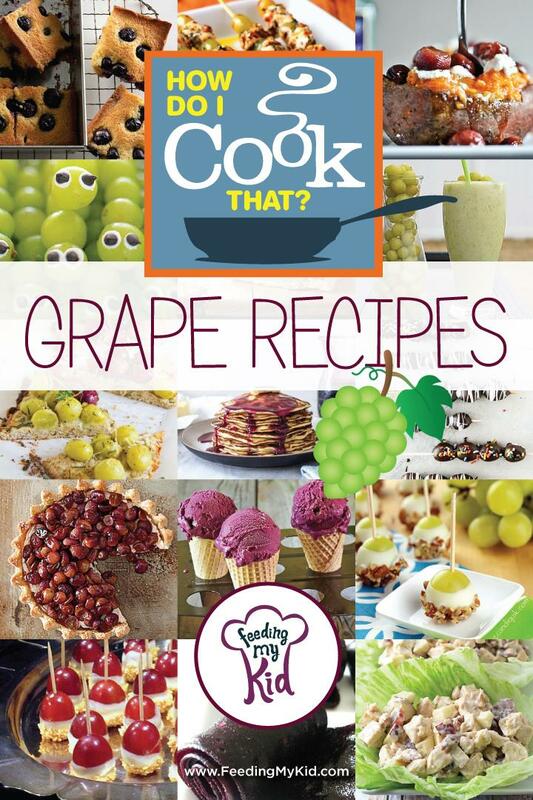 Sweeten things up and cook with grapes and make grape salads! Grapes are a very good source of Vitamin K and Vitamin C, as well as iron and potassium. They’re also low in saturated fat, cholesterol, and sodium. Grapes of all colors are a natural source of beneficial antioxidants and other polyphenols. Pick grapes that are firm and plump, not wet and shriveled. Stems should be green and flexible, which is an indication of freshness. A powdery-white coating on grapes is okay! Known as bloom, this is a natural occurring substance that is non-toxic. 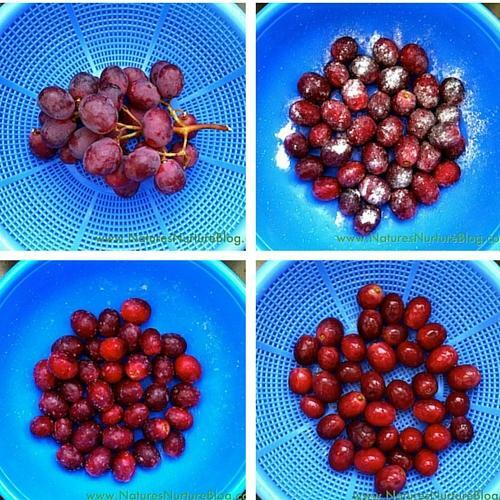 Check out the end of the article below to see how to properly wash your grapes before eating! Cooking with grapes can seem kind of foreign and weird. Our collection of delicious grape recipes below takes off that pressure. Pick one and get cooking! 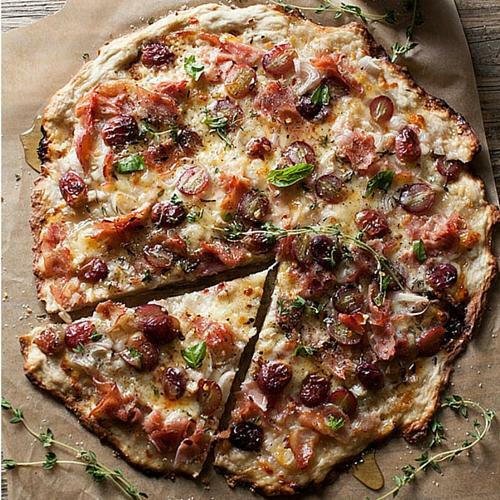 Sweet grapes beautifully compliment sharp cheddar cheese and salty ham on this stunning pizza. It’s surprisingly easy to make, too! Any kid will love this tasty pizza. Make it instead of ordering pizza, and let your kids help by putting on the toppings. 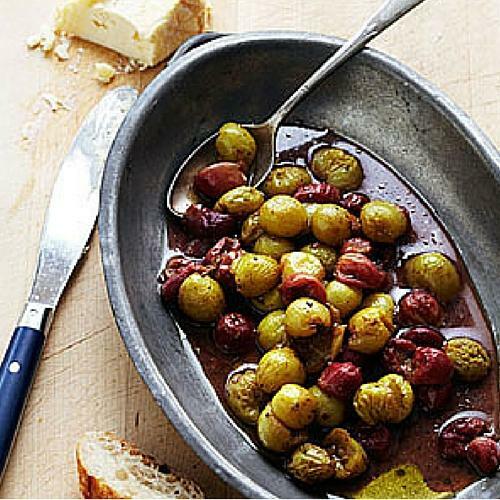 Bring the taste of the Mediterranean to your home with this amazing grape recipe! 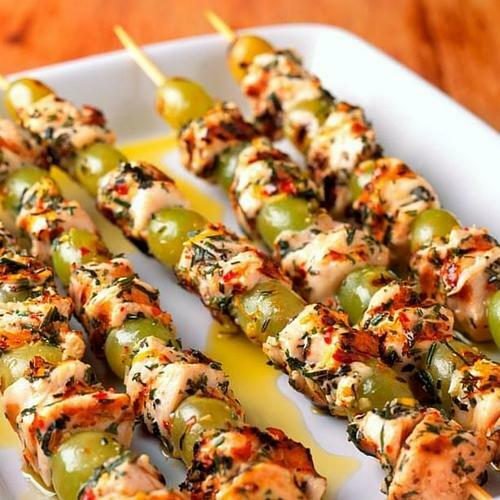 Grapes and chicken are marinaded in olive oil, garlic, rosemary, and oregano, which gives them lots of flavor! Then, the skewers are grilled to perfection. Yum, yum, yum! 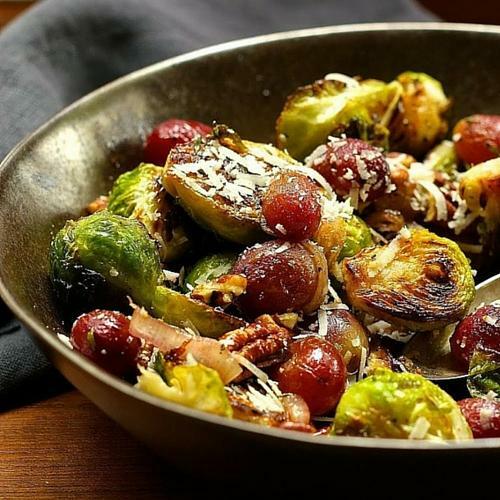 Roasted grapes are combined with caramelized Brussels sprouts and toasted pecans for a very festive and fall-inspired side dish! Pecorino is a hard Italian cheese made from ewe’s milk. It’s not found in most grocery stores, so use Parmesan or Asiago in this tangy grape recipe. 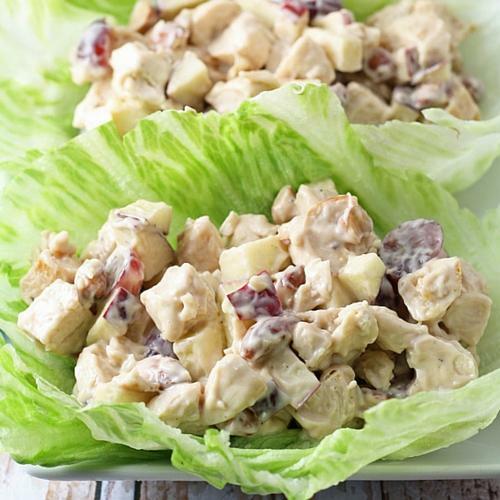 These chicken salad wraps are packed with protein! They’re also super duper easy to make and very nutritious. If your kids aren’t fans of lettuce, use whole wheat bread or whole wheat tortillas instead! 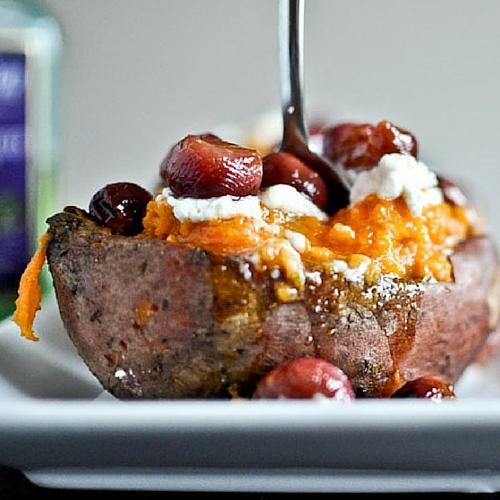 Roasted grapes and goat cheese are piled on top of baked sweet potatoes and then drizzled with honey. 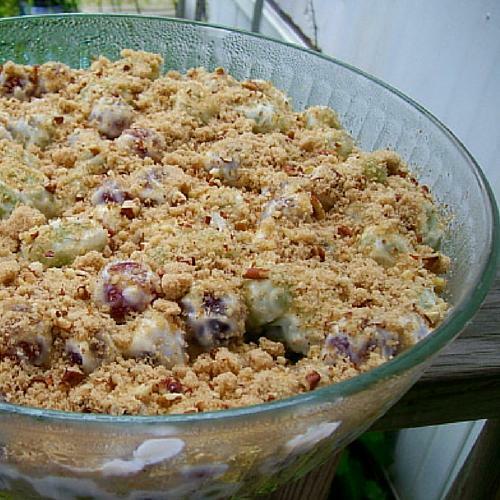 This grape recipe just screams holidays! Your kids are sure to love these “sweet” sweet potatoes. Dig in! Three simple ingredients come together to create a scrumptious appetizer or snack – whichever you please. On top of that, these little skewers are quite possibly the easy and quickest thing to make in the world. You can also use ham as a substitute for prosciutto, as it may be too salty for some kids’ taste. 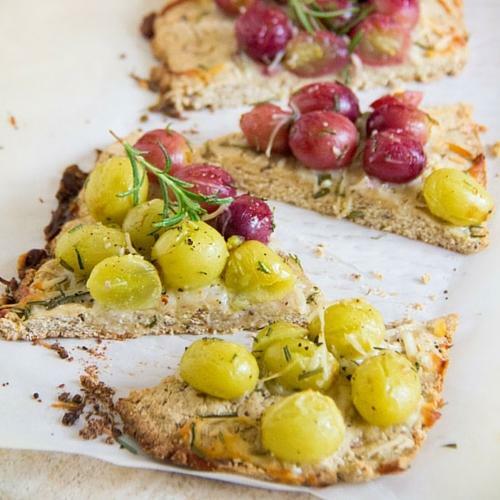 This flatbread might be the most delicious flatbread you’ll ever have – EVER. Roasted grapes on flatbread covered in melty mozzarella is surprisingly tasty. So tasty, in fact, that even your littlest eaters will gobble up this grape recipe, aka this is a fuss-free meal. Hello, weekday winner! 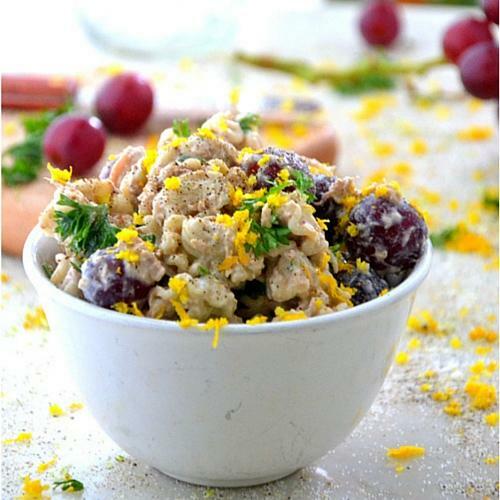 Try this savory yet sweet grape dish for your next holiday party or as a snack for your kids. Slightly crunchy, toasted bread is topped with grapes that have been baked in the oven and creamy ricotta. Divine! 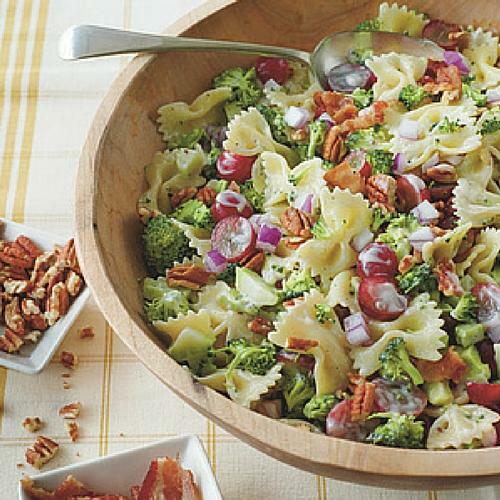 Sweet grapes and broccoli are tossed with al dente pasta, crispy bacon, and pecans, creating the most amazing pasta salad. Your family will really enjoy this grape recipe, whether they’re a broccoli salad fan or not! 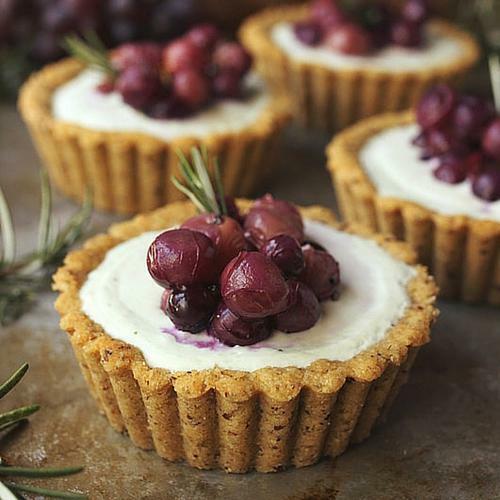 These cute little tarts are packed full of flavor and are grain-free. Roasting grapes brings out their natural sweetness. 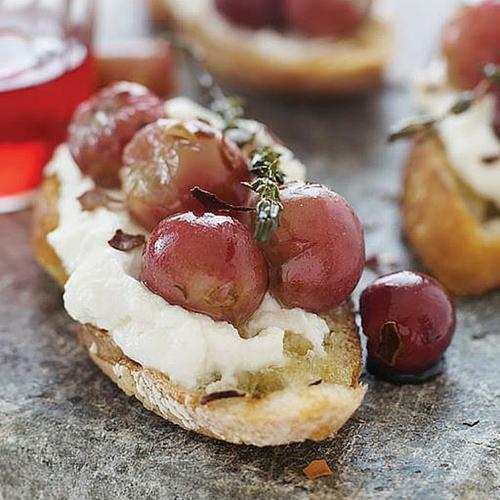 In this grape recipe, they’re paired with tart goat cheese, earthy rosemary, and fresh garlic. Plus, they can be served for or with any meal! This is kind of a DIY grape recipe. 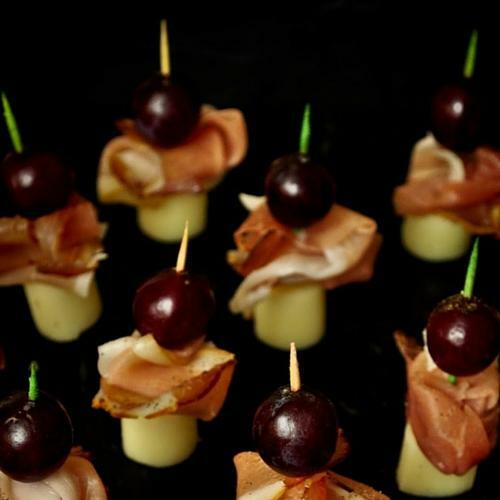 You simply prepare the ingredients: beautifully roasted grapes, triple-cream cheese, and freshly sliced baguette. Then, your kids help themselves! Let them put cheese and grapes on their own slice of baguette and have at it! Although this grape recipe calls for only five ingredients, it’s guaranteed to be a hit with your kids or at any party! 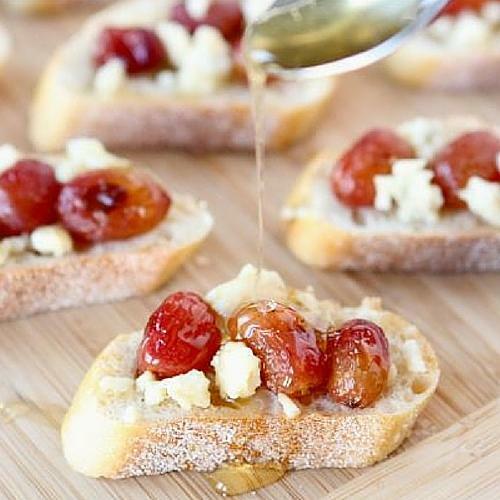 Roasted grapes, toasted baguette, blue cheese, honey, and olive oil come together for a stunning and delicious appetizer or quick snack. Yummy! For a quick and creamy side salad, try out this grape recipe! It’s easy to make and is prepared beforehand, so you don’t have to worry about making it the day of. Leftovers can easily be put back in the fridge until you’re ready to have another bite! Hear me out with this recipe. 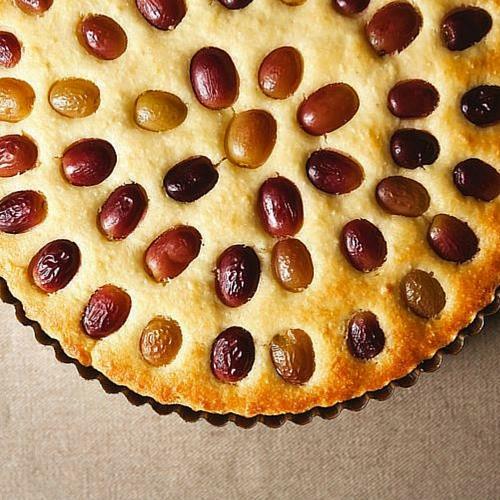 I know grapes and olive oil in a cake seem a little crazy, but trust me when I say that this cake is absolutely delicious. Plus, it takes only a few minutes to make and your kids will love this unique dessert! 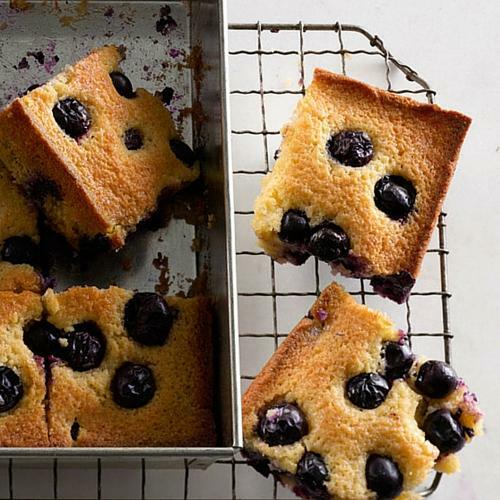 This grape cornmeal cake is reminiscent of a blueberry cake, except sweeter and not tart. 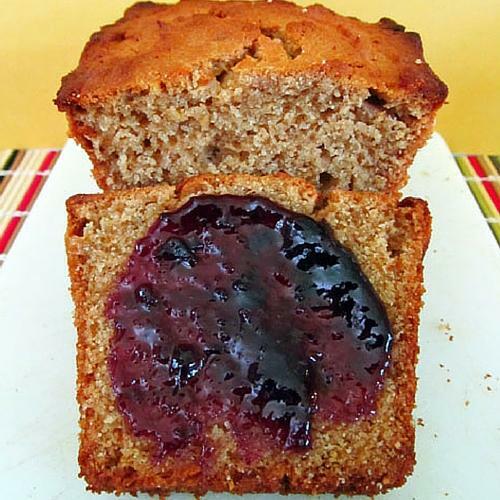 This easy yet yummy cake can be served at brunch or for dessert and topped with a scoop of vanilla ice cream (or Concord grape sherbet – the recipe is below!). 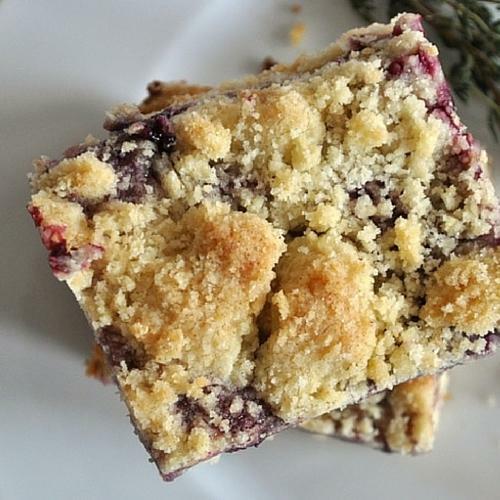 These grape bars are really something special. Concord grapes are cooked down with thyme to make a lovely jam then used as filling for these buttery bar cookies. Serve with a class of milk for an after school snack! 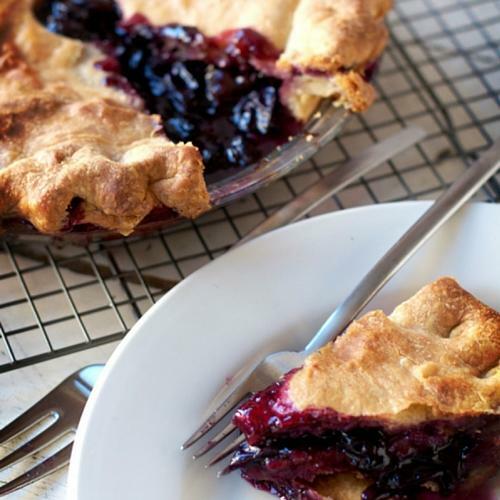 This grape recipe may seem a little intimidating, but, if you’re up for a challenge, you’ll find that this amazing pie was totally worth it! 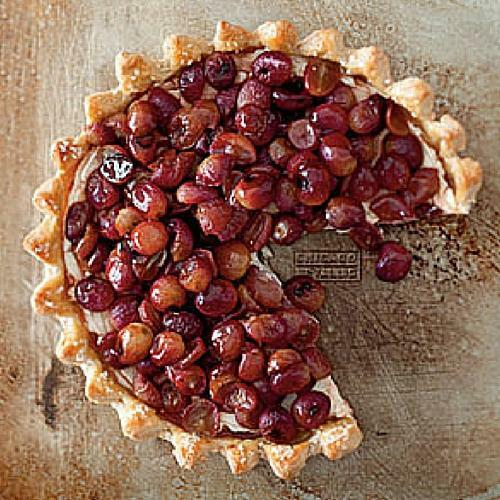 Roasted grapes and mascarpone cheese are baked in a homemade pie crust to utter perfection. Of course, you can also use a store bought pie crust instead of making your own and substitute mascarpone cheese with blended cream cheese and whipping cream. 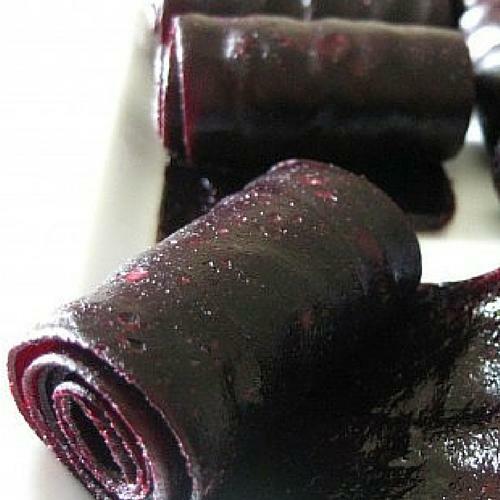 Any child is guaranteed to love this homemade grape fruit leather! It’s such a great alternative for those sugary Fruit Roll Ups, and you can easily pack it for your kids for lunch. Plus, it’s sugar free and has a TRUE grape flavor. Chocolate covered grapes just might taste better than their strawberry counterpart. Seriously, that’s how good these are! 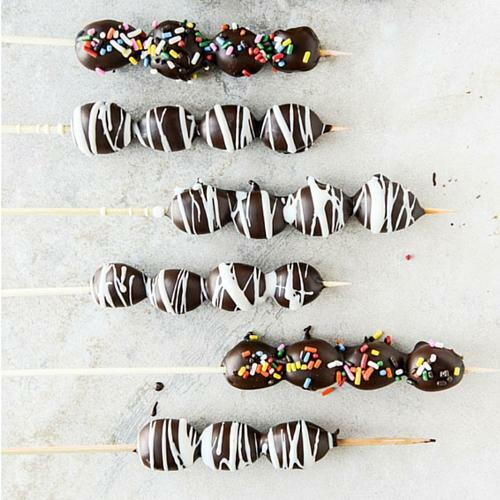 Not only are these skewers easy to make (not to mention pretty), but they also make the perfect afternoon snack and birthday party treat. Brighten up your mornings with this grape syrup that is absolutely to die for. 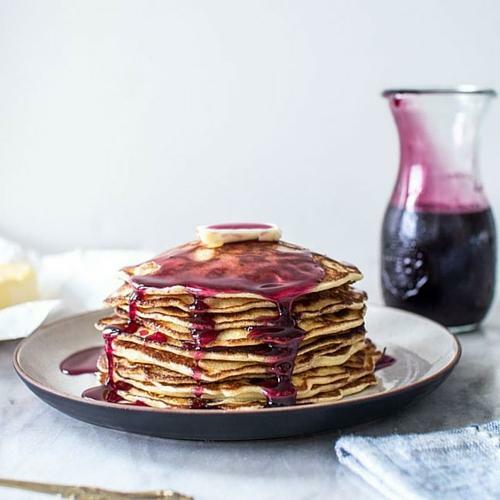 An alternative to maple syrup (and that high fructose corn syrup stuff), this syrup is sweet and fruity with an intense grape flavor. Try serving it over ice cream, waffles, and yogurt to mix it up! Your kids will want to pop these poppers in their mouths all day long. No kidding! These grape poppers are a great way to sneak in fruits, and they’re ridiculously easy to make. 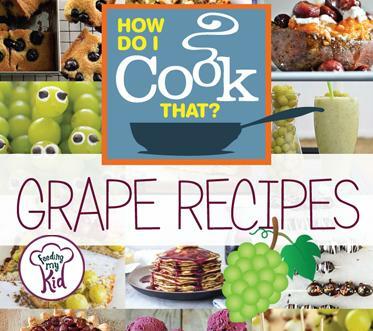 You can even let your kids help you in the kitchen with this grape recipe! After you make this grape jam, you will never buy store-bought jams again. Why should you make your own jam? You can control the amount of sugar and the texture (smooth or chunky or something in between). It’s also much healthier than the ones sold in stores. And absolutely scrumptious! How CUTE are these kabobs? They are perfect for a child’s birthday party or even as a festive after school snack (for you as much as for your kids). 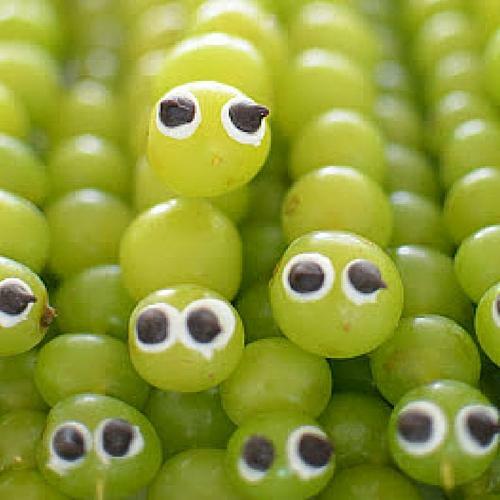 Even picky eaters will love them because they make eating fun. Even better: let them make their own kabobs! Don’t be intimidated by this grape recipe, please! All it takes is four ingredients and some time, and you’ll have a beautiful sherbet you won’t find in any grocery store or ice cream shop. Your kids will love it too! 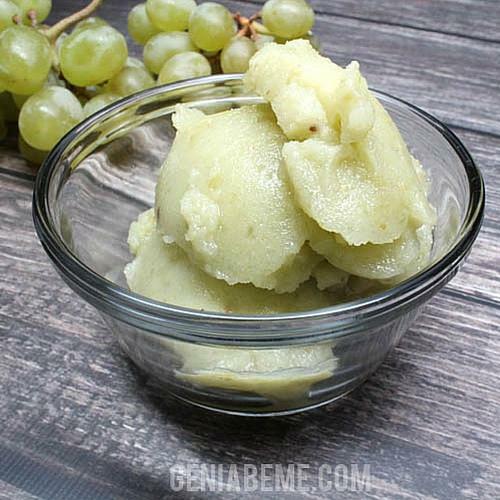 This grape recipe is a great way to use green grapes that are too sour for your kids’ taste. Simply throw them in the freezer then blend with water and vanilla yogurt. Bam, you’ve got a grape smoothie! And it’s pretty darn good too. This pie might become a new holiday favorite at your home. Move over, pumpkin pie! It’s not complicated to make and has a sweet, delicate flavor that any family member of yours will enjoy – even your picky eaters. This recipe calls for only one ingredient. Yup, you read that right. ONE ingredient. 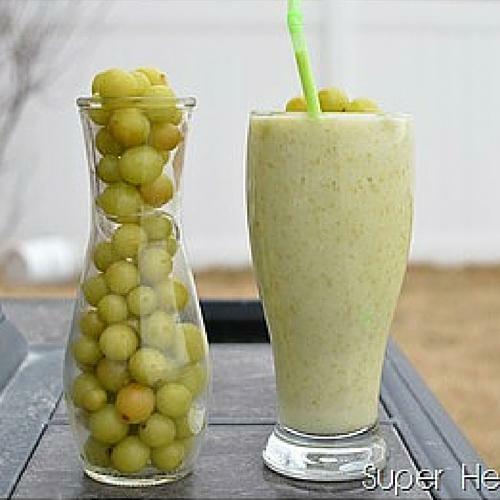 Simply freeze green grapes, blend them, and enjoy! You can also use whatever grapes you have on hand at the moment. 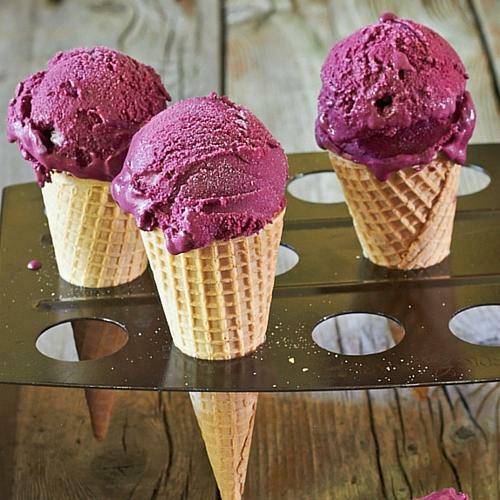 This grape sorbet makes a great after school snack. 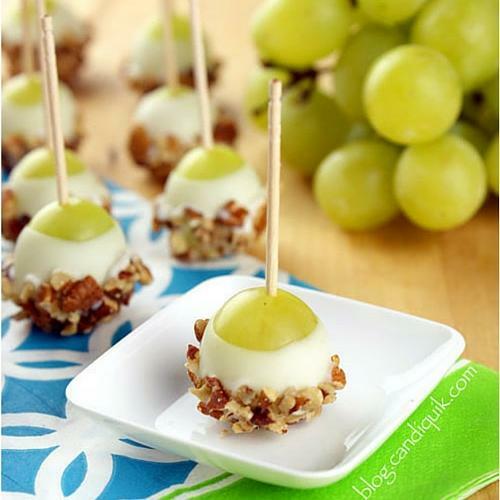 Sweeten things up and cook with grapes! 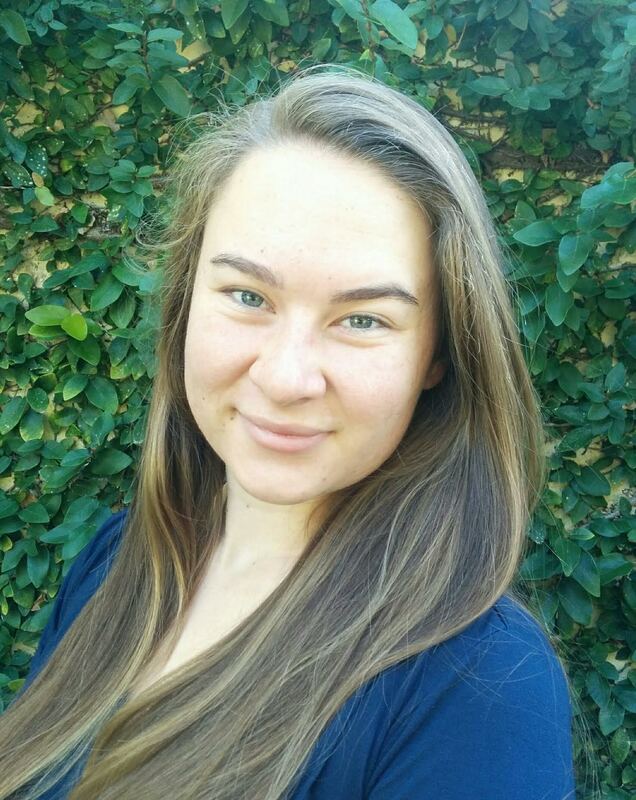 Next articleYour Might be Creating An Over-Eater and Not Even Know It!